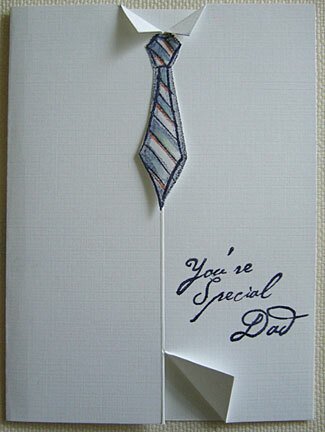 Making your own Happy Fathers Day cards can be fun. Just be creative and you can come up with some unusual ideas. 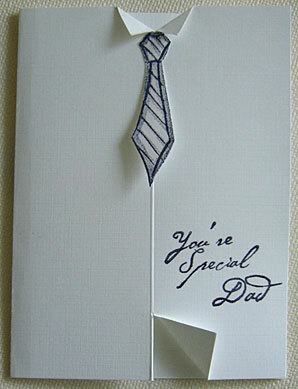 Here is one of the two happy fathers day cards I have created. To view the other more complicated fathers day card, just click here.. This is a simple handmade card and you can easily finished making it within an hour. If you don't have the words stamp 'You're Special, Dad', just use 'Happy Father's Day' instead or use your computer to print the words.ay, here are the two cards and the items needed to make these Happy Father's Day Cards followed by the step-by-step instructions. click here to view a bigger image of this Fathers Day card. Trim white card stock and fold to make a basic blank card. Mark center of card front and score a line from the top to the bottom of the card. Use your knife to make a half inch cut from the top on the score line. From the cut mark half inch to the right and also to the left. Score and fold to make collar of shirt. From the center bottom, make a one inch cut from the bottom on the score line. Mark lightly about 3/4 inch to the right, score and fold. Ink tie rubber stamp with dark blue ink and stamp on white scrap. Pour clear embossing powder on the stamped image. Shake off excess powder and heat. Trim the embossed tie image. Ink words rubber stamp with dark ink and stamp on right side of white card front. Heat embossed with clear embossing powder. Glue top of tie to the collar. Optional: Color stripes of tie with blue and brown markers. Here's how it looks when colored with the blue and brown markers.